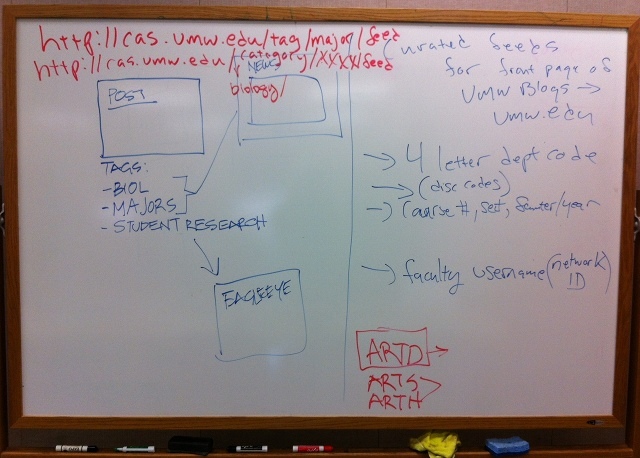 I’m usually not a whiteboard image blogger, but we’ve been going through some structural work at UMW with various projects and we are having to map things out more and more. 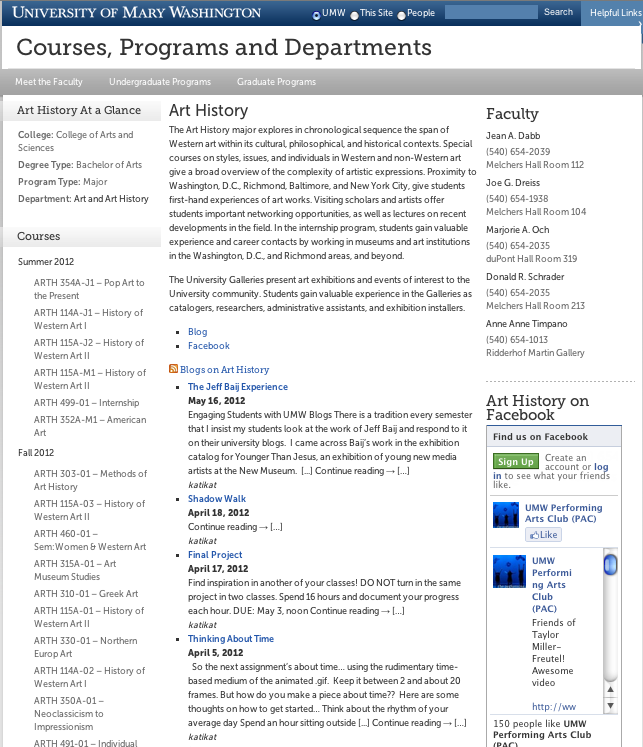 One of the things we’ve been working on with Cathy Derecki and Curtiss Grymala is the idea of how we start aggregating course work for classes and resource sites back to departmental sites on umw.edu. Or, bring them into planet like sites that capture course work out in the open. Not only will this come from UMW Blogs, but it will also come from students and faculty using the Domain of One’s Own project, which means a large number will be self-hosted blogs. And we’ll depend a lot more on the Syndication of Syndication approach, which is exciting because thanks to Martha Burtis, the sign-up of Domain of One’s Own will automatically capture domain information spreadsheet and we can start figuring out how to discover feeds and tag filters. At the same time, Martha has also figured out how to pass the blog URL to FeedWordpress for sites like ds106 and associate it with the right user, which means the syndication process around UMW Blogs might become even more seamless. This is real headway! How do we start aggregating all of these various blogs into a series of nodes that are discoverable whether they be individual (as seen above), course, discipline and/or departmental (as seen below). I wonder if the future of aggregation might not be imagined on an institutional level like we are trying to do at UMW right now, this could allow for the ideas of empowering folks to manage and maintain their own data. An experiment in both studying and applying the ways the future is changing some elements of what constitutes a literate society. Understanding aggregation and syndication as realities and metaphors as a kind of literacy? This entry was posted in Domain of One's Own, umw, umw.edu, WordPress and tagged aggregation, domain of one's own, Fall 2012, rss, syndication, umw, umw.edu, umwblogs. Bookmark the permalink. You had me at “future of aggregation”. I just hope there is one. Inspiring stuff. The Bava abides.